THE Davis family is among the forty-nine “best families” selected by the American Historical-Genealogical Society for whom the Society has published family histories during the past few years. The Davis family has been prominent in the British Empire and in the United States, its members having played important roles in war and in peace. Family pride is a commendable trait and should be cultivated. All Davises have just cause to be proud of their family history and traditions. in England and Wales. This is due to the fact that there are so many variations of the name. The original name was David — which signifies well- beloved — popular in Biblical days and a favorite among the Scottish kings. Day, Dakin, etc. The Irish form is M’Daid; the French, Devis. Original settler of Jamestown. Captain James Davis was born between 1575 and 1580 in England. He was the son of Sir Thomas Davis. Captain James Davis married Rachel Keyes circa 1607/8. Adventurers of Purse and Person, page 238, Rachell’s name came from Patent Bk. 1, p. 17; CP I, p. xxxiv. Captain James Davis died on 16 February 1622/23 in James City, Henrico, Nansemond County, Virginia; death noted by Hotten: “James Davis, dead at his plantation over the water from James City, Februay 16, 1623.” Whether he was killed by the Indians or not is not shown. In 1607 he first arrived in the northern colony of Virginia called Sagahadoc, Maine, which he helped establish. Captain James Davis was commander of the fort established at the mouth of Kennebec River 19 August 1607. He was also member of the Council of the New Colony. Capt. John Smith mentions Capt. James Davis as among the leaders and councillors of the New Colony. Unfortunately the colonists at Sagahadoc had a very hard time of it and most returned home to England by 1610. At that point, Captain James sailed on to the southern colony in Virginia and made his home there. In 1607, Capt. James Davis and Capt. Robert Davis, the sons of Englishman Sir Thomas Davis came to America. James Davis was one of the original settlers of Jamestown, Virginia. He also was Captain of Fort Sagadahoc, the new, but short-lived English colony settled at the mouth of the Kennebec River in Maine where brother Robert was a Sergeant Major. James and Robert’s father, Sir Thomas, later followed them to America, coming over on “The Margaret” and settling in Jamestown in 1619. Following is an account of the voyage and expedition to build and colonize Maine in which our Davis ancestors had a part: Capt. James Davis who was Captain of Fort Sagadahoc, his brother Capt. Robert Davis was Sergeant-Major of the fort, and their brother John Davis is also briefly mentioned. The Jamestown settlement was planted in Virginia in May, 1607. Less than three weeks later the Plymouth Company sent out an expedition which founded a colony at the mouth of the Sagadahoc, now known as the Kennebec River, in Maine. One of the chief sponsors of this expedition was Sir John Popham, Lord Chief Justice of England. His nephew George was a leader of the colonists. 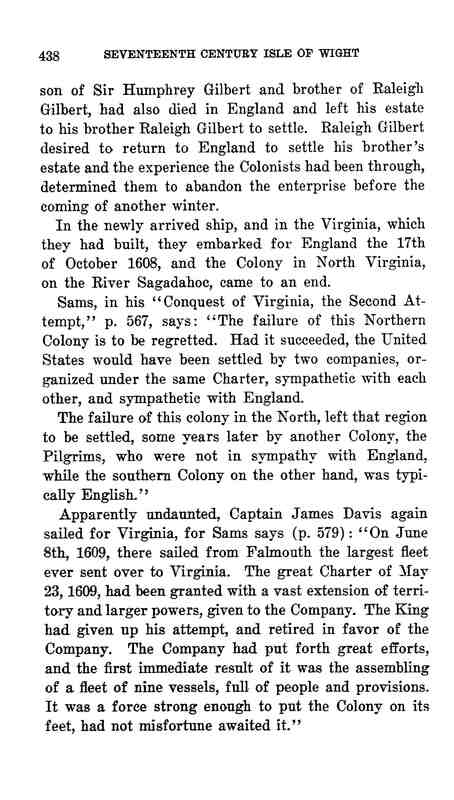 This account, found in the “Second Book” of William Strachey’s History of Travel into Virginia Britania, describes the voyage in much more detail than it does the actual founding of the colony. June 1607 – The late Lord Chief Justice would not for all his hard handsell and spanish mischief give over his determination for planting of a colony within the aforesaid so goodly a country upon the River of Sagadahoc. (The opening sentence refers to a previous expedition captured by Spanish pirates.) Against the next year he prepared a greater number of planters, and better provisions, which in 2 ships he sent thither, a flying boat (A flyboat was small, easily maneuvered, could sail in shallow water, ideal for coastal exploration) called the Gift Of God wherein a kinsman of his, George Popham, commanded, and a good ship called the Mary and John of London, wherein Raleigh Gilbert (Brother of Bartholomew Gilbert who was with Gosnold in 1602) commanded which with 120 persons for planters. They broke ground from Plymouth in June, 1607, the 25th fell with Gratiosa, and the 28th took in wood and water at Flores and Coruez, (Islands in the Azores) from whence they always kept their course to the westward, as much as wind and weather would permit. They ran 200 leagues from Flores, and in the Latitude of 42 degrees they found the compass to be varied one whole point. July 1607 – From whence they stood still to the westward until the 27 of July being then in the latitude of 43 and 2/3 where they threw out the dipsing lead (The “dipsing” or deep sea lead was used to measure the ocean depth. It is referred to by other names in most of the journals) and had ground but 20 fanthom and 22 fanthom upon a bank, and here they fished some 3 hours and took near 200 of cod, very great fish and where they might have laden their ship in little time. From hence they stood in for the main, the wind being at so-west, and as they ran in for the land, they always sounded from this bank, and having run some 12 leagues from the bank nor-west they sounded and had 60 fanthom, ooze ground black. The wind now growing scant, they were constrained to stand for the so-ward and sounded again the next day, being the 28 of July, and had 30 fathoms small stones and white shells, fishing ground. 29. They made a west way until noon and then sounding had 160 fathom black ooze. 30. In the morning they had sight of the land (Nova Scotia) and it bore off them nor-west. They sounded being 10 leagues from the shore and had 100 fathoms black ooze. They made towards the shore but could not recover it before the night took them for which they were constrained to bear off a little from the land and lie a hull all that night, where they found abundance of fish very large and great, and the water deep, hard aboard the shore, 18 or 20 fanthoms. 31. Standing in for the shore in the afternoon they came to and anchored under an island, for all this coast is full of islands but very sound and good for shipping to pass by them, and the water deep hard aboard them. They had not been at an anchor two hours when there came a Spanish shallop (It would be interesting to know from what expedition the Indians acquired these two boats, and how) to them from the shore, in her eight savage men and a little savage boy who at the first rowed about them, and would not come aboard notwithstanding they offered them bread, knives, beads, and other small trifles. Having gazed awhile upon the ship they made show to depart, howbeit when they were a little from them they returned again and bodily came up into the ship, and 3 of them stayed all night aboard. The rest departed and went to the shore, showing by signs that they would return the next day. August 1607 – The first of August the same savages returned with three women with them in another Biscay shallop, bringing with them many beaver skins to exchange for knives and beads. The sagamo of that place, they told them, was called Messamot seated upon a river not far off which they called Emannet. The savages departing they hoisted out their boat, and the pilot Captain R. Davies, with 12 others rowed into the bay wherein their ship rode and landed on a galland island, where they found gooseberries, strawberries, raspices, hurts, (“Hurts” are whortleberries or huckleberries) and all the island full of huge high trees of divers sorts. After they had delighted themselves there awhile, they returned aboard again and observed the place to stand in 44 degrees and 1/3. 2. (These dates refer to the month of August) About midnight the moon shining bright and the wind being fair at nor-east, they departed from this place setting their course so-west, for so the coast lies. At their first coming the Indians betook them to their arms, their bows and arrows, but after Nahanada had talked to Skidwares and perceived that they were Englishmen, he caused them to lay aside their bows and arrows, and he himself came unto them and embraced them and made them much welcome, and after 2 hours interchangeably thus spent, they returned aboard again. 9. Being Sunday the chief of both the ships with the greatest part of all the company, landed on the island where the cross stood, which they called St. George’s Island, and heard a sermon delivered unto them by Mr. Seymour their preacher, and so returned aboard again. 10. Captain Popham manned his shallop and Captain Gilbert his ship’s boat with 50 persons in both and departed for the River of Pemaquid, carrying with them Skidwares. Being arrived in the mouth of the river there came forth Nahanada with all his company of Indians with their bows and arrows in their hands, they being before his dwelling houses would not willingly have all our people come on shore, being fearful of us. To give them satisfaction the captains with some 8 or 10 of the chiefest landed, but after a little parley together they suffered all to come ashore using them in all kind sort after their manner. Nevertheless after one hour they all suddenly withdrew themselves into the woods, nor was Skidwares desirous to return with us any more aboard. Our people loath to offer any violence unto him by drawing him by force, suffered him to stay behind, promising to return unto them the day following, but he did not. After his departure our people embarked themselves, and rowed to the further side of the river and there remained on the shore for the night. 11. 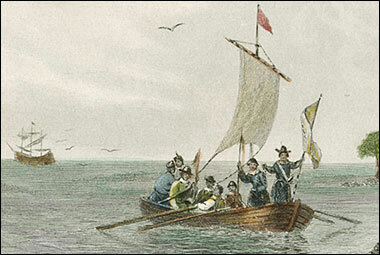 They returned to their ships towards the evening, where they still rode under St. Georges Island. 12. They weighed anchors and set sail to go for the River of Sagadahoc. They had little wind, and kept their course west. 14. So soon as the day gave light they perceived that they were hard aboard the shore in the bay that they were in the day before, which made them look out for some place to thrust in the ship to save their lives, for towing the long boat, it lay sunk at the stern 2 hours and more, yet would they not cut her off in hope to save her, so bearing up helm they stood in right with the shore, when anon they perceived two little islands to which they made and there they found good anchoring where they rode until the storm broke which was the next day after. Here they freed their boat and had her ashore to repair her, being much torn and spoiled. These islands are two leagues to the westward of Sagadahoc. Upon one of them they went on shore, and found 4 savages and one woman, the island all rocky and full of pine trees. 15. The storm ended and the wind come fair for them to go for Sagadahoc, the river whither they were bound to and enjoined to make their plantation in, so they weighed anchor and set sail and came to the eastward and found the island of Sequin and anchored under it, for the wind was off the shore by which they could not get to Sagadahoc, yet Captain Popham with the flyboat got in. 16. In the morning Captain Popham sent his shallop to help in the Mary and John which weighed anchor and being calm was soon towed in and anchored by the Gift’s side. 17. Captain Popham in his pinnace with 30 persons and Captain Gilbert in his long boat with 18 persons more went early in the morning from their ship into the River of Sagadahoc to view the river and to search where they might find a fit place for their plantation. (The location was recommended by Martin Pring who had investigated it the year before.) They sailed up into the river near 14 leagues and found it to be a very gallant river, very deep and of a good breadth, and full of fish leaping above the water, (The Sturgeon leaps out of the water and falls back with a spectacular splash.) and seldom less water than 3 fathom when they found least. Whereupon they proceeded no farther, but in their return homewards they observed many goodly islands therein, and many branches of other small rivers falling into it. 18. They all went on shore, and there made choice of a place for their plantation, at the mouth or entry of the river on the west-side, (for the river bendeth itself towards the northeast) being almost an island of a good bigness being in a province called by the Indians Sabino, so called of a sagamo, or chief commander under the grand Basshaba. (Champlain spelled this chief’s name Bessabez, and Waymouth, Bashabe.) As they were on shore, 3 canoes full of Indians came by them but would not come near, but rowed away up the river. 19. They all went to the shore where they had made choice of their plantation and where they had a sermon delivered them by their preacher, and after the sermon the President’s Commission was read with the laws to be observed and kept. George Popham, Gentleman, was nominated president; Captain Raleigh Gilbert, James Davies, R. Seymour (Preacher), Captain Richard Davies, Captain Harlow (the same who brought away the savages at this time showed in London, from the River of Canada) were all sworn assistants and so they returned aboard again. 20. All went to shore again, and there began to entrench and make a fort, and to build a storehouse, so continuing the 21, 22, 23, 24, 25, 26, 27. 28. Whilst most of the hands labored hard about the fort and the carpenters about the building of a small pinnace, the president overseeing and applying every one to his work, Captain Gilbert departed in the shallop upon a discovery to the westward and sailed all the day by many gallant islands. The wind at night coming contrary they came to an anchor that night under a headland by the Indians called Semeamis, (Cape Elizabeth) the land exceeding goodly and great, most oak and walnut, with spacious passages between and no rubbish under and a place most fit to fortify, being by nature fortified on two sides with a spring of water under it. 29. They departed from this headland Semeamis lying in the height of 43 1/2 degrees and rowed along the shore to the westward, for that the wind was against them, and which blew so hard that they reached no further than an island 2 leagues off, where whilst they anchored two canoes passed by them, but would not come near them. 30. They returned homeward before the wind, sailing by many goodly and gallant islands, for betwixt the said headland Semeamis, and the River of Sagadahoc is a very great bay (Casco Bay) in the which there lie so many islands and so thick and new together, that can hardly be discerned the number, yet may any ship pass betwixt the greatest part of them, having seldom less water than 8 or 10 fathom about them. These islands are all overgrown with woods, as oak, walnut, pine, spruce trees, hazelnuts, sarsaparilla, and hurts in abundance, only they found no sassafras at all in the country. This night they arrived at the fort again. 31. And the 1 of September 2, 3, and 4 nothing was done but only for the furtherance and building of the fort and storehouse to receive ashore their victuals. 5. About noon there came into the entrance of the River of Sagadahoc and so unto the fort as our people were at their work 9 canoes with 40 savages in them, men, women and children, and amongst them was Nahanada and Skidwares. They came up into the fort and the president gave them meat and drink and used them exceeding kindly. Two or three hours they remained there, and then they parted, Skidwares and another savage remaining, with whom at night Captain Gilbert, James Davies and Ellis Best went over to the furthest side of the river, whither all the rest had withdrawn themselves, and there remained with them all the night, and early in the morning, the savages departed in their canoes for the river of Pemaquid promising Captain Gilbert to accompany him in their canoes to the River of Penobscot where the Basshaba dwells. 6. and 7. The business of the fort only attended. 8. Captain Gilbert with 22 others departed in the shallop for the River of Penobscot, taking with him divers sorts of merchandise to trade with the Basshaba, but by reason the wind held easterly being contrary, it was 3 days before they got unto the River of Pemaquid. 11. Early in the morning they came into the River of Pemaquid there to call Nahanada and Skidwares to go along with them, but being arrived there, they found that they were all gone from thence unto the River of Penobscot before, wherefore they set sail for that river, and all that day as likewise 12 and 13 they sailed and searched to the eastward, yet by no means could find the river, for which they returned, their victuals spent and the wind large and good and in 2 days arrived again at the fort, having had a sight the 15th in the morning of a blazing-star to the nor-east of them. The 16, 17, 18, 19, 20, 21, 22 all labored about the fort and building up of the storehouse. 23. Captain Gilbert accompanied with 19 others, departed in his shallop to go for the head of the River of Sagadahoc. They sailed all this day, and the 24 the like until 6 of the clock in the afternoon, when they landed on the river’s side, where they found a champion land, (“Champion” refers to grassland – perhaps beaver meadows.) and very fertile, where they remained all that night. 25. In the morning they departed from thence, and sailed up the river, and came to a flat low island, (Evidently near Augusta. Old maps show an island there.) where is a great cataract or downfall of water, which runs by both sides of this island very short and swift. On this island they found great store of grapes both red and white, good hops, as also chiballs (“Chiballs” are onions) and garlic. They hauled their boat, with a strong rope through this downfall perforce, and went near a league further up, and here they lay all night. In the first of the night there called certain savages on the further side of the river unto them in broken English. (These upriver Indians probably learned their English during the time of year when they frequented the coast. They very likely also knew some French.) They answered them again and parlied long with them. Towards morning they departed. 26. In the morning there came a canoe unto them, and in her a sagamo and 4 savages, some of those which spoke to them the night before. The sagamo called his name Sabenoa, and told us how he was Lord of the River of Sagadahoc. They entertained him friendly, and took him into their boat and presented him with some trifling things which he accepted. Howbeit he desired some one of our men to be put into his canoe, as a pawn of his safety, whereupon Captain Gilbert sent in a man of his. Presently the canoe rowed away from them, with all the speed they could make up the river. They followed with the shallop, having great care that the sagamo should not leap overboard. The canoe quickly rowed from them and landed, and the men made to their houses being near a league in on the land from the riverside and carried our man with them. The shallop making good way, at length came unto another downfall which was so shallow and so swift that by no means they could pass any further. Captain Gilbert with 9 others landed and took their fare, the savage sagamo, with them and went in search after those other savages whose houses the sagamo told Captain Gilbert were not far off. After a good tedious march they came at length unto those savages’ houses, where they found near 50 able men very strong and tall, such as their like they had not seen, all new painted and armed with their bows and arrows. Howbeit after the sagamo had talked with them, they delivered back again the man and used all the rest very friendly, as did ours the like by them, who showed them their commodities of beads, knives, and some copper of which they seemed very fond, and by way of trade made show that they would come down to the boat and there bring such things as they had to exchange them for ours. So Captain Gilbert departed from them and within half an hour after he had gotten to his boat, there came 3 canoes down unto them and in them some 16 savages, and brought with them some tobacco and certain small skins which were of no value, which Captain Gilbert perceiving and that they had nothing else wherewith to trade, he caused all his men to come aboard. As he would have put from shore, the savages perceiving so much, subtly devise how they might put out the fire in the shallop (Fire was needed in order to set off the musket charge), by which means, they saw they should be free from the danger of our men’s pieces. To perform the same, one of the savages came into the shallop and taking the firebrand which one of our company held in his hand thereby to light the matches, as if he would light a pipe of tobacco, as soon as he had gotten it in his hand, he presently threw it into the water and leapt out of the shallop. Captain Gilbert seeing that, suddenly commanded his men to betake them to their muskets, and the targeteers to form the head of the boat, and bade one of the men before, with his target (A “Target” was a shield.) on his arm, to step on the shore for more fire. The savages resisted him and would not suffer him to take any, and some others holding fast the boat rope that the shallop could not put off, Captain Gilbert caused the musketeers to present their pieces, the which the savages seeing presently let go the boat rope and betook them to their bows and arrows and ran into the bushes, nocking their arrows but did not shoot, neither did ours at them. So the shallop departed from them to the further side of the river, where one of the canoes came unto them and would have excused the fault of the others. Captain Gilbert made show as if he were still friends and entertained them kindly and so left them, returning to the place where he had lodged the night before, and there came to an anchor for that night. The head of this river stands in 45 degrees and odd minutes. Upon the continent they found abundance of spruce trees such as are able to mast the greatest ship his Majesty has, and many other trees, oak, walnut, pineapple. (“Pineapple” refers to white pines.) There were fish in abundance and great stores of grapes, hops and chiballs. Also they found certain pods in which they supposed, the cotton wool to grow, (Milkweed) and also upon the banks many shells of pearl. 27. Here they set up a cross and then returned homeward, in the way seeking the by-river of some note called Sasanoa. 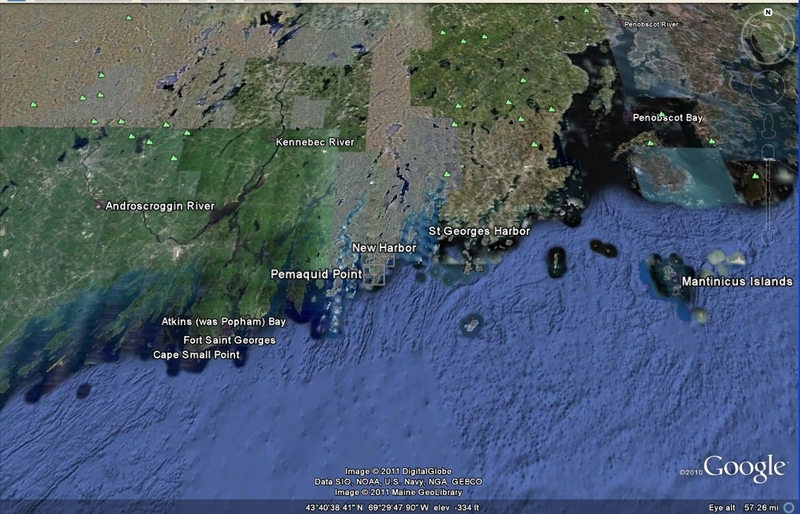 (This tidal connection to Sheepscot Bay retains the name Sasanoa River) This day and the next they sought it, when the weather turning foul and full of fog and rain they made all haste to the fort, before which the 29 they arrived. 30. and the 1 and 2 of October, all busy about the fort. 3. There came a canoe unto some of the people of the fort as they were fishing on the sand, in which was Skidwares who bade them tell their president that Nahanada with the Basshaba’s brother, and others were on the further side of the river and the next day would come and visit him. 4. There came 2 canoes to the fort, in which were Nahanada and his wife and Skidwares and the Basshaba’s brother, and one more called Amenquin, a sagamo, all whom the president feasted and entertained with all kindness both that day and the next. Being Sunday the president carried them with him to the place of public prayers, which they were at both morning and evening, attending it with great reverence and silence. 6. The savages departed, all except Amenquin, the sagamo, who would needs stay amongst our people a longer time. Upon the departure of the others the president gave unto every one of them copper, beads, or knives, which contented them not a little, as also delivered a present unto the Basshaba’s brother to be presented unto the Basshaba, and another for his wife, giving him to understand, that he would come unto his court in the River of Penobscot and see him very shortly bringing many such like of his country commodities with him. You may please to understand how whilst this business was thus followed here soon after their first arrival, that had dispatched away Captain Robert Davies in the Mary and John to advertise both of their safe arrival and forwardness of their plantation within this River of Sagadahoc, with letters to the Lord Chief Justice importuning a supply for the most necessary wants to the subsisting of a colony to be sent unto them betimes the next year. After Captain Davies’ departure they fully finished the fort, trenched and fortified it with 12 pieces of ordinance, and built 50 houses therein, beside a church and a storehouse, and the carpenters framed a pretty pinnace of about some 30 ton, which they called the Virginia, the chief shipwright being one Digbe of London. Many discoveries likewise would have been made both to the main and unto the neighbor rivers, and the frontier nations fully discovered by the diligence of Captain Gilbert had not the winter proved so extreme unseasonable and frosty. For it being in the year 1607 when the extraordinary frost was felt in most parts of Europe, it was here likewise as vehement, by which no boat could stir upon any business. Howbeit as time and occasion gave leave, there was nothing omitted which could add unto the benefit or knowledge of the planters. When Captain Davies arrived there in the year following, set out from Topsam, the port-town of Exeter, with a ship laded full of victuals, arms, instruments and tools, etc., albeit he found Mr. George Popham the president and some others dead, yet he found all things in good forwardness, and many kinds of furs obtained from the Indians by way of trade, good store of sasparilla gathered and the new pinance all finished. But by reason Captain Gilbert received letters that his brother was newly dead and a fair portion of land fallen unto his share which required his repair home, and no mines discovered nor hope thereof, being the main intended benefit expected to uphold the charge of the plantation, and the fear that all other winters would prove like this first, the company by no means would stay any longer in the country, especially since Captain Gilbert was going to leave them and Mr. Popham as aforesaid dead, wherefore they all embarked in this new arrived ship and in the new pinance the Virginia and set sail for England, and this was the end of that Northern Colony upon the River of Sagadahoc. Note: “Sir John Popham, Lord Chief Justice of England in the year 1606 procured means and men to possess it.” He sent, among others, Capt. Robert Davis to act as Sergeant-Major and Capt. James Davis to be Captain of the fort. John Davis also is mentioned among the “noble captains” on the expedition. Thomas DAVIS b: Abt 1613 in Henrico, Nansemond, VA, Death: BEF 30 Sep 1683 in Nansemond, Virginia ~ Maj. Thomas Davis was born in 1612/13 in Jamestown (Chuckatuck), Nansemond County, Virginia. He was the son of Captain James Davis and Rachel Keyes. Maj. Thomas Davis married Mary Bowers circa 1639/40. Maj. Thomas Davis died before 20 September 1683 in Nansemond County, Virginia. Thomas was one of the Virginia settlers on Herring Creek. The Virginia Asssembly had decreed that planters who came at their own cost before the coming away of Sir Thomas Dale, that is prior to April 1616, should have on the first division of land, 100 acres for their own personal adventure and also the same for every single share, amounting to the sum of 12-10-0 paid into the London Company of Virginia. 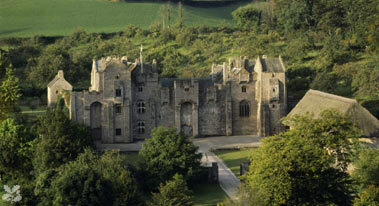 This was the reason that Captain Thomas Davis received this grant of land, as the heir of his father. His mother Rachell Davis was probably dead long before 1633. Thomas Davis had many other land grants, deeds and patents. The Founders of Anne Arundel and Howard Counties, Maryland by J.D. Warfield. Brown’s “First Republic”, pp. 128, 318. Council Journals, Vol. I, p. 283. Burgess Journals, Vol. II, 1659-95, p. 9. 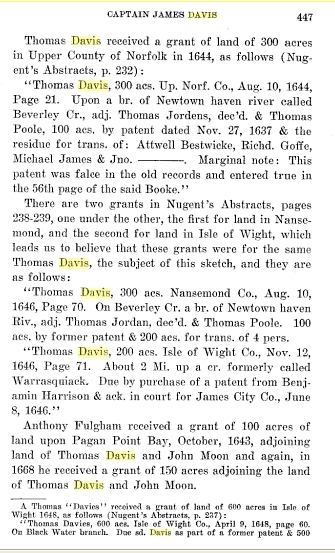 “Adventurers of Purse and Person” by First Families of VA; pg 221… patent issued to Thomas Davis, 10 Aug 1644, for 300 acres in Nansemond Co. notes that it adjoined the land of Thomas Jordan dec’d. – “Caviliers and Pioneers” pg 266 record of DEED James Davis 141 acres Nansimund Co. on Chuckatuck Cr. 20 Sep 1683 p 310 adj his brother Thomas Davis; Thomas Chutchin and William Thompson. 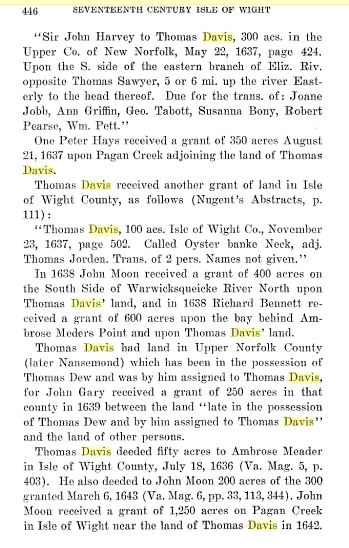 Being 1/3 of land his father Major Thomas Davis dyed seized of, who devised sd James – DEED: pg 55 18 Mar 1668 Isle of Wight Co. 100 acres upon Pagan point Bay land of Maf Thomas Davis and Mr. Jno Mohoone – DEED: Richard and John Sanders 350 acres in the W. Br. in the Up Par. 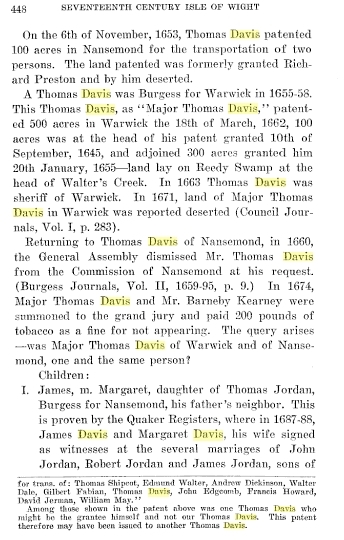 Nansemond 30 Oct 1689…300 acres granted to Thomas Davis 11 Mar 1664 and now in possession of said John and Richard – BIRTH-RELATIONSHIP: to parents 1988 IGI Va. Batch #8609103 SS24 relationship that the Thomas Davis born to James and Rachel was the same Thomas Davis who was father of James who married Margaret Jordan time and place only. Note: One account has James Davis’s parents as Major Thomas Davis and Mary Bowers. 22 May 1637 – 300 acres – Upper county of New Norfolk later Nansemond upon south side of East branch of Elizabeth River. 23 Nov 1637 – 100 acres – Oyster Bank Neck, Isle of Wight. bordered by Thomas Poole – 100 acres – 27 Nov 1637 and Thomas Jordan. 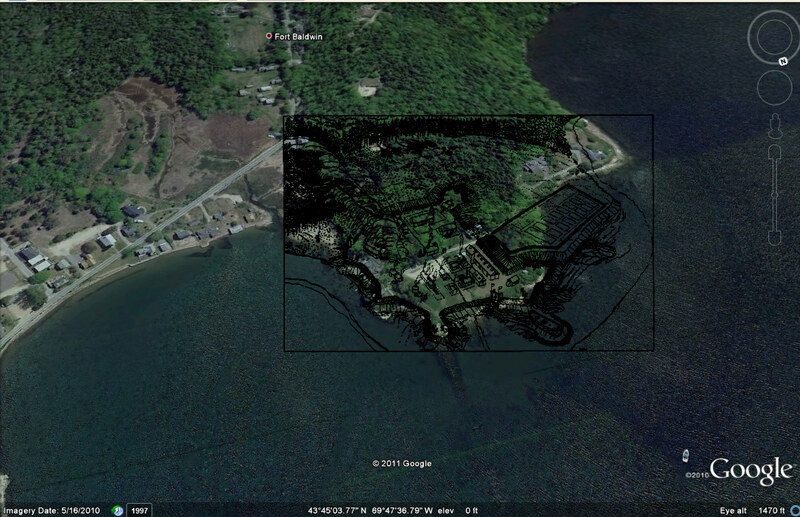 1638 – Richard Bennett – 600 acres – Bay behind Ambrose Point. 21 Aug 1637 – Peter Hays – 350 acres – Pagan Creek. 1642 – John Moon – 1,250 acres – Pagan Creek, Isle of Wight. He was bordered by Tom Sayer and later John Gary, 250 acres in 1639. 10 Aug 1644 – 300 acres – Branch of Newton Haven River called Beverly Creek bordered by Thomas Jordens. One Peter Hays received a grant of 350 acres August 21, 1637 upon Pagan Creek adjoining the land of Thomas Davis. In 1638 John Moon received a grant of 400 acres on the South Side of Warwicksqueicke River North upon Thomas Davis’ land, and in 1638 Richard Bennett received a grant of 600 acres upon the bay behind Ambrose Meders Point and upon Thomas Davis’ land. Thomas Davis had land in Upper Norfolk County (later Nansemond) which has been in the possession of Thomas Dew and was by him assigned to Thomas Davis, for John Gary received a grant of 250 acres in that county in 1639 between the land “late in the possession of Thomas Dew and by him assigned to Thomas Davis” and the land of other persons. Thomas Davis deeded fifty acres to Ambrose Meader in Isle of Wight County, July 18, 1636 (Va. Mag. 5, p. 403). He also deeded to John Moon 200 acres of the 300 granted March 6, 1643 (Va. Mag. 6, pp. 33, 113, 344). John Moon received a grant of 1,250 acres on Pagan Creek in Isle of Wight near the land of Thomas Davis in 1642. “Thomas Davis, 300 acs. Nansemond Co., Aug. 10, 1646, Page 70. On Beverley Cr. a br. of Newtown haven Riv., adj. Thomas Jordan, dec’d. & Thomas Poole. 100 acs. by former patent & 200 acs. for trans. of 4 pers. Anthony Fulgham received a grant of 100 acres of land upon Pagan Point Bay, October, 1643, adjoining land of Thomas Davis and John Moon and again, in 1668 he received a grant of 150 acres adjoining the land of Thomas Davis and John Moon. 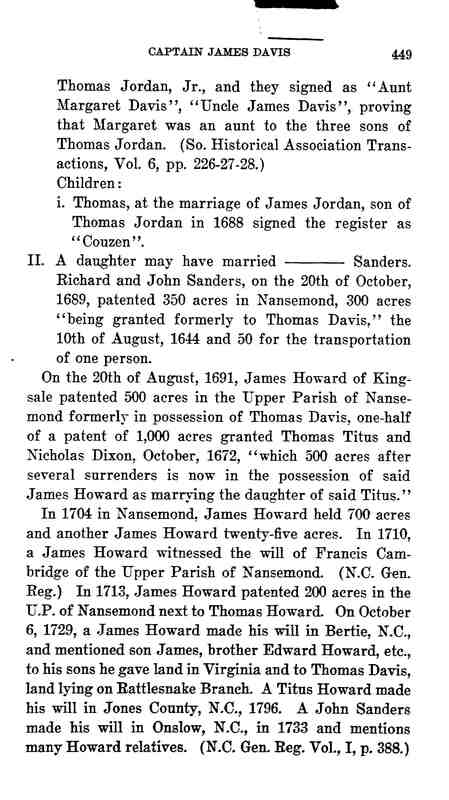 On the 6th of November, 1653, Thomas Davis patented 100 acres in Nansemond for the transportation of two persons. The land patented was formerly granted Richard Preston and by him deserted. 3.The Founders of Anne Arundel and Howard Counties, Maryland by J.D. Warfield. Captain James Davis was master of the “Mary and John” and he wrote an account of the voyage called “The Relation of a voyage unto New England begun from the Lizard, ye first of June 1607.” Note: The author of this Ms. is not shown, his name being left blank on the title page, but The Rev. Henry Otis Thayer in his account of the Sagadahoc Colony (p. 19) gives his reason for believing that the author of the “Relation” was Captain James Davis, which seems conclusive. Capt. 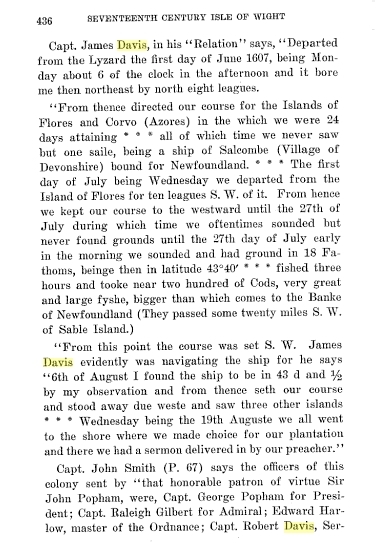 James Davis, in his “Relation” says, “Departed from the Lyzard [Plymouth, England] the first day of June 1607, being Monday about 6 of the clock in the afternoon and it bore me then northeast by north eight leagues. 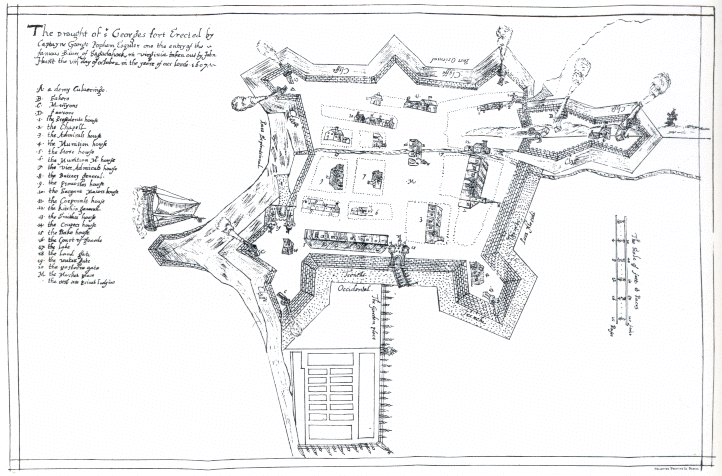 19 Aug 1607 – Established Fort at mouth of Kennebec River in Maine. The colony was called the “Sagadahoc Colony.” This colony preceded the “Mayflower” landing at Plymouth, Mass. by 13 years. Captain John Smith says the officers of this colony by “That honorable patron of virtue Sir John Popham were: Captain George Popham for president. Captain Raleigh Gilbert for admiral. Edward Harlow, Master of the Ordinance, Captain Robert Davis, Sergeant Major, Captain Ellis Bert, Marshall, Mr. Leaman, Secretary, Captain James Davis, to be Captain of the Fort, Mr. Gome Carew to be searcher, all these were of the Counsel.” The preacher was Richard Seymour. 6 October 1607, James Davis sailed for England as Captain of the “Mary and John”. His narrative in “Relation” suspends on the 6th of October 1607 and Mr. Thayer concludes from this that it was because James Davis sailed away for England. This vessel arrived in England December 1st after a voyage of 53 days. 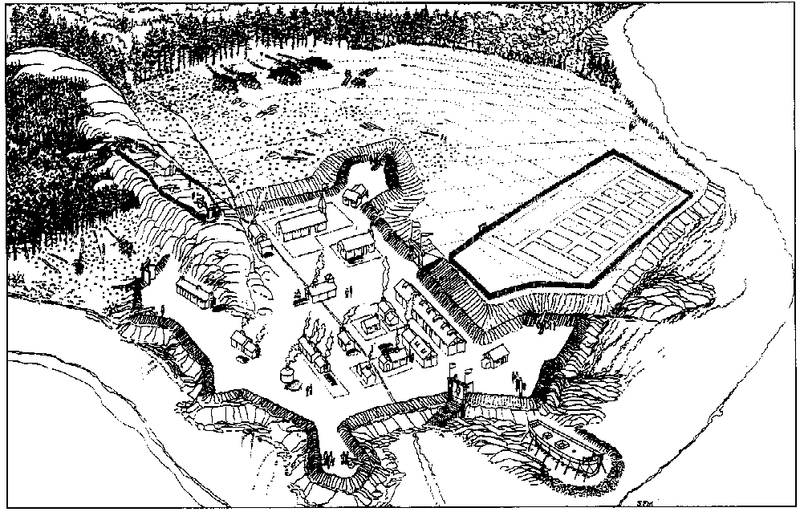 A plan of Fort St. George at Sagadahoc inscribed “taken out on the 8th of October 1607” was found in later years with the narrative. The “Gift” also sailed from Sagadahoc Colony to England on 15 Dec 1607 and arrived at Plymouth 7 February 1608. These ships on arriving found that Sir John Popham (President) The Chief Justice, had died 10 Jun 1607, ten days after they had sailed away from England to Northern Virginia. After these ships had left Sagadohoc, the last one carrying 45 persons who wished to return to England, the settlers who remained Began to build a ship with their limited means in the winter time in this bleak country and when this ship was finished, they called it the “Virginia” and it seems to have been a staunch trust-worthy vessel. 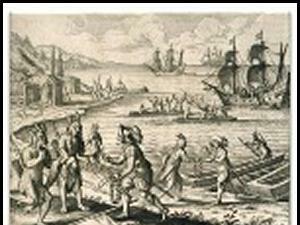 Captain James Davis again set sail for Sagadahoc and arrived, it is supposed, about the month of May 1608. He found the colonists had been through a severe winter. George Popham, the first president, had died, and Raleigh Gilbert was now the president. Sir John Gilbert, eldest son of Sir Humphrey Gilbert and the brother of Raleigh Gilbert, had also died in England and left his estate to his brother Raleigh Gilbert to settle. Raleigh Gilbert desired to return to England to settle his brothers estate and the experience the colonists had been through, determined them to abandon the enterprise before the coming of another winter. 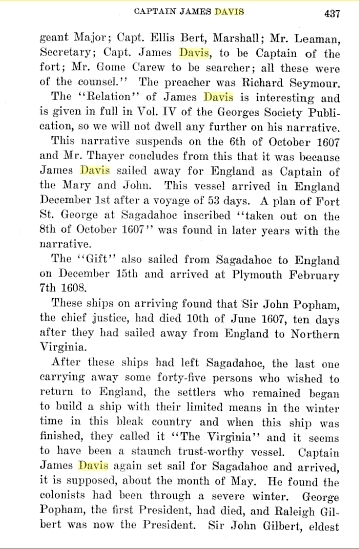 In the newly arrived ship, and in the “Virginia” which they had built (of which Captain James Davis was aboard), they embarked for England 17 Oct 1608, and the colony in North Virginia, on the River Sagadahoc came to an end. After passing the Canary Islands the fleet encountered a great hurricane. The vessels were scattered and the “Virginia” arrived among the last. The ship the “Sea Adventure” carrying the fleet commanders, Sir James Somers and Sir Thomas Gates, was wrecked on Somers Island, now called Bermuda. The “Catch” one of the vessels, foundered with all on board. “Unite” – Captain Wood – Departed England 8 (18) Jun1609 and arrived Jamestown, Virginia 21 Aug 1609. “Blessing” – Captain Gabriel Archer – Departed England 8 (18) Jun 1609 arrived Jamestown, Virginia 21 Aug 1609. “Lion” – Captain Webb – Departed England 8 (18) Jun 1609 and arrived Jamestown, Virginia 21 Aug 1609. “Falcon” – Captain John Martin – Departed England 8 (18) Jun 1609 and arrived Jamestown, Virginia 21 Aug 1609. “Diamond” – Captains Ratcliffe and King – Departed England 8 (18) Jun 1609 and arrived Jamestown, Virginia Aug 1609. 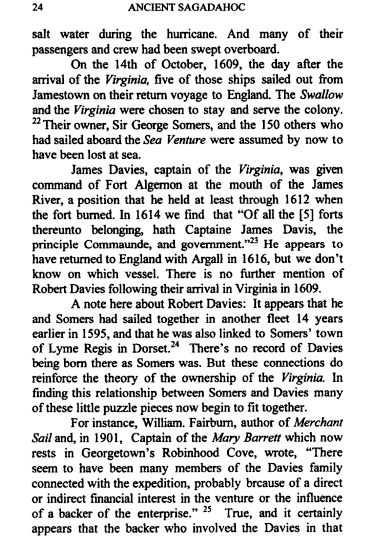 “Swallow” – Captain Moone – Departed England 8 (18)Jun 1609 and arrived Jamestown, Virginia Aug 1609. “Catch” – Master Matthew Fitch – Departed England 8 (18) Jun 1609 and was lost at sea with all aboard. “Virginia” – Captain James Davis – Departed England 8 (18) Jun 1609 and arrived Jamestown, Virginia 3 Oct 1609. “Sea Adventure” – Captain Christopher – With Sir Thomas Gates and Sir James Somers on board with the new Charter of the Virginia, Company, which had been drafted by Sir Francis Bacon and signed by King James I on May 23 1609. This ship wrecked on Bermuda during hurricane. The “Deliverance” and “Patience” were built from the wreck of “Sea Adventure” and these two ships then left Bermuda 20 May 1610 bound for Jamestown, Virginia and arrived there May 1610. There were two factions at this time opposing one another in the Virginia Company of London, and the Smith faction apparently did not receive this fleet with any great joy. This may account for the fact that Captain Percy, the Governor, mentions Captain James Davis very frequently in his “True Relation” whereas the Smith faction mentions him very little. “The first incident recorded is the arrival of the ‘Virginia,’ which had formed one of the great fleet of nine which left England on the eighth of June 1609. It was October when she at last reached her destination, as the ‘Catch,’ one of the vessels, was known to have foundered with all on Board, the arrival of the ‘Virginia’ left only the ‘Sea Adventure,’ the most important of all still to be accounted for. They thought she was certainly lost. Captain John Ratcliffe was Commander of the “Discovery,” one of the three ships which came over with the first colonists to Jamestown. He is often referred to in narratives of those times as the “Luckless and Ill-fated Captain Ratcliffe.” It seems that Captain Ratcliffe commanded the fort at Point Comfort called “Fort Algernon,” a favorite Christian name in the family of Percy, Earls of Northumberland. 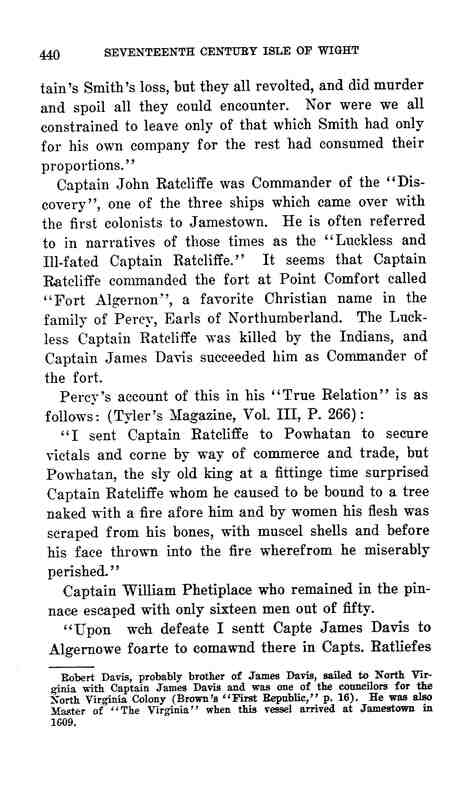 The Luckless Captain Ratcliffe was killed by the Indians, and Captain James Davis succeeded him as Commander of the fort. 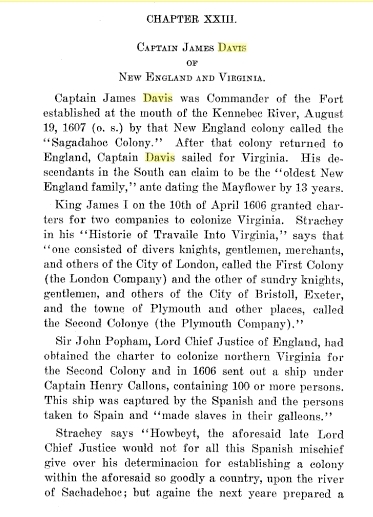 Note: Robert Davis, brother of James Davis, sailed to North Virginia with Captain James Davis and was one of the councilors for the North Virginia Colony (Brown’s “First Republic,” p. 16). He was also Master of “The Virginia” when this vessel arrived at Jamestown in 1609. “By this Tyme being Reasonable well recovered of my sickness I did undertake a jorney unto Algernowns foarte bothe to understand how things weare there ordered as also to have bene Revenged of the Salvages att Kekowhatan who had treacherously slayne dyvers of our men. Our people I fownd in good care and well lykenge haveinge concealed their plenty from us above att James Towne. “Their sayleigne some two myles down the River I sent Capt. Davis A shoare with moste of my Sowldiers, myselfe being wearyed before and for my owne part, but an easie foote man was Capt: Davis. At his landeinge, he was approached by some Indyans who spared nott to send their arrowes Amongste our men but within A shorte Tyme he putt them to flighte and landed withoutt further opposity on marcheinge About fowrtene myles into the country cutt downe their corne, burned their howses, Temples and Idolles and amongste the reste A Spacyous Temple cleane and neattly keptt A thinge strange and seldome sene amongste the Indyans in those partes. So havinge performed all the spoyle he cowulde Retourned aboarde to me ageine and then we sayled downe the River to James Towne. “My Lord Generall not forgetting old Powhatan subtell treacery sent a messanger unto him to demand certain Armies and Dyvrs men who we supposed might be living in his country but he returned no other then proud and distainfull answers. Whereupon my Lorde being much incensed caused a commission to be drawn wherein he appointed me Chief Commander over seventy men and sent me to take revenge upon the Paspaheans and Chiconamians and so shipping myself and my soldgiers in two boats I departed from James Town the 9th of August 1610 and the same night landed within three miles of Paspahas town then drawing my soldiers into Battalio placing a Captain or Lieutentant at every file we marched towards the town having an Indian guide with me named “Kempes” whom the Provoste Marshall led in a hand lock. This subtell savage leading us out of the way I bastinaded him with my truncheon and threatened to cut off his head whereupon the slave altered his course and brought us the right way near unto the town so that then I commanded every leader to draw away his file before me to beset the savages houses that none might escape with a charge not to give the alarm until I were come up unto them with the colors. At my command I appointed Captain William West to give the alarm the which he performed by shooting of a pistol. And then we fell in upon them put 15 or 16 to the sword and almost all the rest to flight, whereupon I caused my drum to beat and drew all my soldiers to the Colors. My Lieutentant bringing with him the Queen and her children and one indian prisoner for the which I taxed him because he had spared them his answer was that having them now in my custody I might do with them what I pleased. “Upon the same I caused the indians heads to be cut off. And then dispensed my files appointing my soldiers to burn their houses and to cut down their corn growing about the town, and after we marched with the Queen and her children to our boats again, where being no sooner well shipped my soldiers did begin to murmur because the Queen and children were spared. So upon the same council being called it was agreed upon to put the children to death the which was affected by throwing them overboard and shooting out their brains in the water yet for all this cruelty the soldiers were not pleased and I had much to do to save the Queens life for that time. 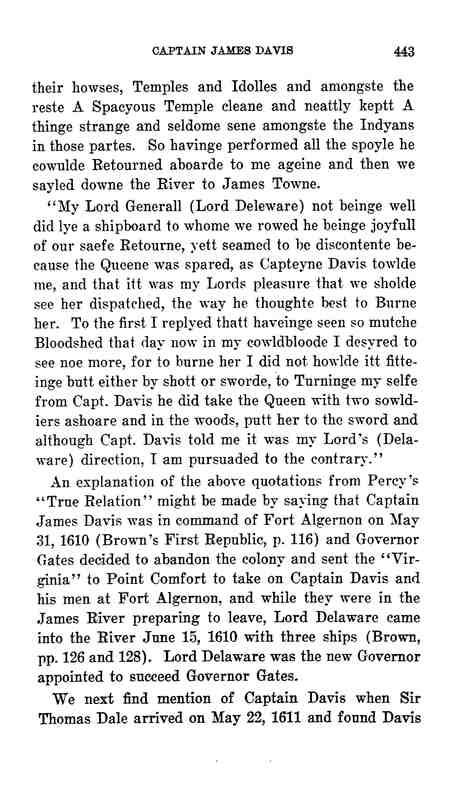 An explanation of the above quotations from Percy’s “True Relation” might be made by saying that Captain James Davis was in command of Fort Algernon on May 31, 1610 and Govenor Gates decided to abandon the colony and sent the “Virginia” to Point Comfort to take on Captain Davis and his men at Fort Algernon, and while they were in the James River preparing to leave, Lord Delaware came into the river 15 Jun 1610 with three ships (Brown, pp. 126, 128). Lord Delaware was the new govenor appointed to succeed Govenor Gates. 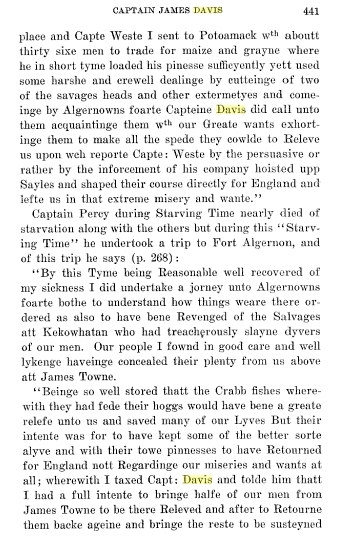 We next find mention of Captain Davis when Sir Thomas Dale arrived 22 May 1611 and found Davis in command at Fort Algernon (Brown, p. 149). The two forts, Henry and Charles, which were located on the capes bearing those names, had been abandoned and Sir Thomas Dale ordered Captain Davis to repossess them and put him in command of all three forts. On 27 June 1611 some Spanish vessels arrived opposite Fort Algernon and according to Brown (p. 152) requested the surrender of Captain Davis. 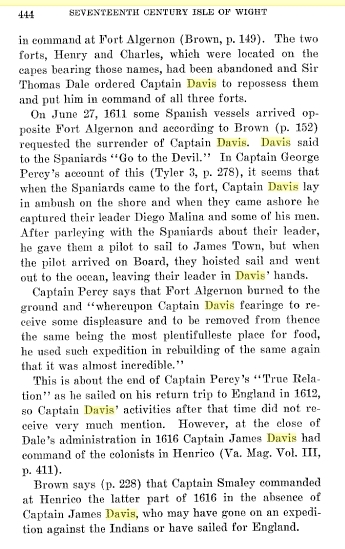 Davis said to the Spaniards “Go to the Devil.” In Captain George Percy’s account of this (Tyler III, p. 278), it seems that when the Spaniards came to the fort, Captain Davis lay in ambush on the shore and when they came ashore he captured their leader Diego Malina and some of his men. After parleying with the Spaniards about their leader, he gave them a pilot to sail to James Town, but when the pilot arrived on board, they hoisted sail and went out to the ocean, leaving their leader in Davis’s hands. 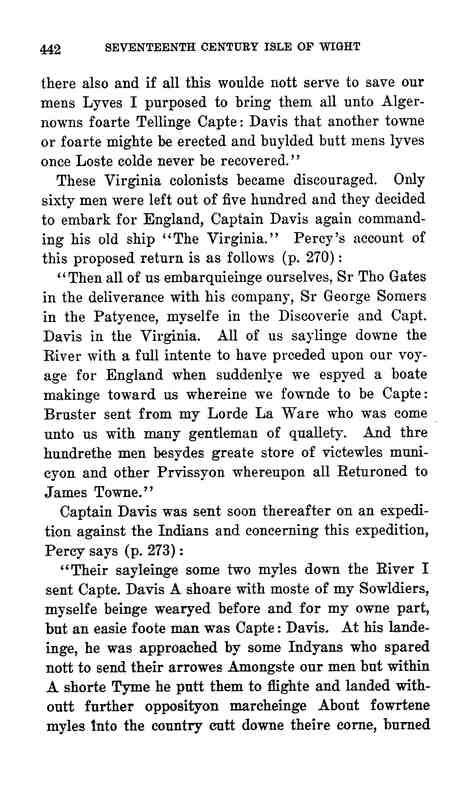 This is about the end of Captain Percy’s “True Relation” as he sailed on his return trip to England in 1612, so Captain Davis’ activities after that time did not receive very much mention. However, at the close of Dale’s administration in 1616, Captain James Davis had command of the colonists in Henrico (Va. Mag., Vol. III, p. 411). 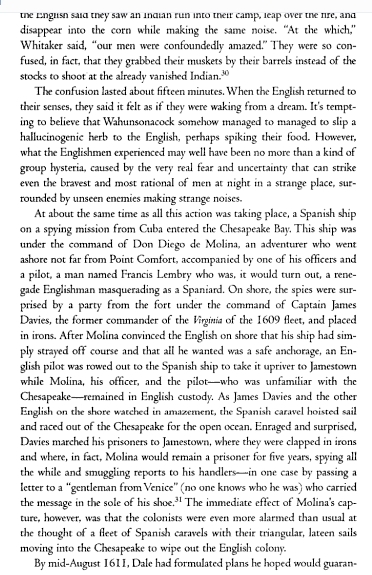 Brown (p. 228) says that Captain Smaley commanded at Henrico the latter part of 1616 in the absence of Captain James Davis, who may have gone on an expedition against the Indians or have sailed for England. Captain James Davis died in Virginia, at his plantation over the water from James City, February 16, 1623 (Hotten, p. 236). Whether he was killed by the Indians or not is not known. 1. Emigrants by Hotten, p. 236. 2. 17th Century Isle of Wight County, VA, by John Bennett Boddie, 1938, Chapter XXIII, Captain James Davis of New England and Virginia; pp. 434-49. 3. Historie of Travaile Into Virginia by William Strachey. 4. “Sagadahoc Colony,” by The Rev. Henry Otis Thayer, The Georges Society Pub., Vol. IV. 5. True Relation by Captain George Percy, written circa 1607, Tyler’s Magazine, Vol. III. 6. Conquest of Virginia, the Second Attempt, by Sams. 7. The Relation of a voyage unto New England begun from the Lizard, ye first of June 1607 by Captain James Davis, The Georges Society Publication, Vol. IV. 8. Some Southern Colonial Families, III, David A. Avant (Tallahassee, Florida, 1989), pp. 205-52. Captain James Davis married Rachel Keyes circa 1607/8. Adventurers of Purse and Person, page 238, Rachell’s name came from Patent Bk. 1, p. 17; CP I, p. xxxiv. The Welsh Davises derive their descent, according to the best authorities, from the Prince of Powis, the opponent of Ethelfrid, King of Northumberland, at the battles of Chester and Bangor, about the commencement of the seventh century. Nineteenth in descent from Prince Brachwel of Powis was Meilir Gryg, direct ancestor of David, son of John ap David of Llivior, who, according to the Welsh custom, assumed the modern surname of Davies in the year 1637 when signing a deed of family settlement. Note: I will add the connecting genealogy when I get the time. English authorities, claim that this Welsh line can be traced back to those brave Britons who lined the coast of Kent to oppose the landing of Julius Caesar, but the record as given starts a few centuries before the Norman Conquest, beginning with Prince Rhodri “Molwynog,” the cognomen meaning ” Welsh blood being up.” He settled on the north of the Severn after his removal from Cambrian Wessex, where many of the Britons who preferred liberty to the foreign yoke followed their chief. Arms — A goat argent, horned or, standing on a child of the same, swaddled gules, and feeding on a tree eradicated vert, a crescent for difference. Crest — On a mount vert a goat couchant argent, under a tree proper. This line descends from David, whose son Hugh ap David (Davis) of Hope had a son William ap Hugh, whose heir Jeuan ap William of Hope married Alson, daughter of John Hewes. He was succeeded by David ap Jeuan, of Marshe, in com. Salop, who married Eliun, daughter of John Williams. 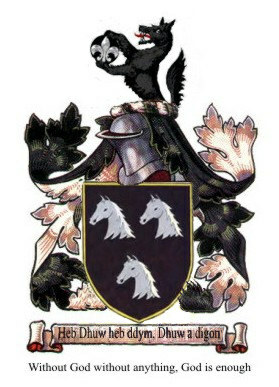 Reynold Davys, the son and heir, married Ellen, daughter of James Morris, who had sons Edward and James Davis. Of these, James married Miss Martyn and had a son, John Davis. 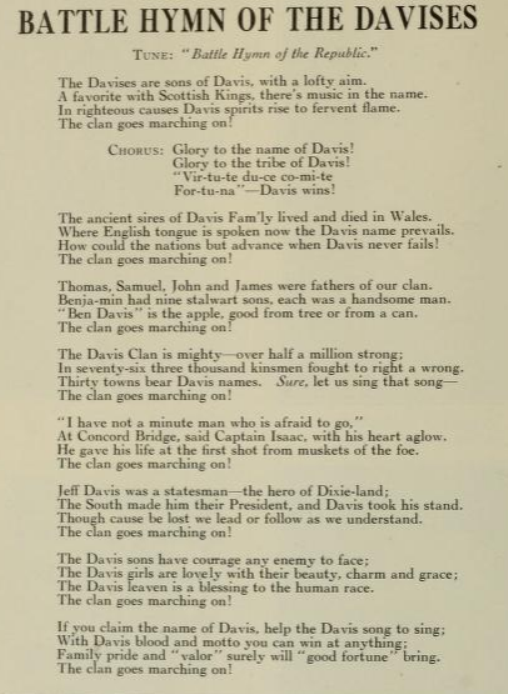 Although the late George Lachlin Davis stated in his account of the early emigrants that the Davises of Mount Hope did not leave the principality of Wales until after 1720, we find an early Davis, with the very suggestive Welsh name of Evan Davis, receiving a patent for 200 acres of land on the Severn in the year 1672. The similarity of the names of their estates would suggest that the Davises of Hope in Great Britain were forebears of the Davises of Mount Hope in Maryland. This is an interesting point for further investigation. Whether or not the various original settlers of this name came from Wales originally does not concern us. The Davis name has been prominent in the annals of Maryland ever since the days of the first notable assembly whose records have been preserved to us, for in the year 1637 John Davis sat as a representative for St. Marie’s Hundred, while the several successive years Thomas Davis contributed his services in molding the foundations of our government. 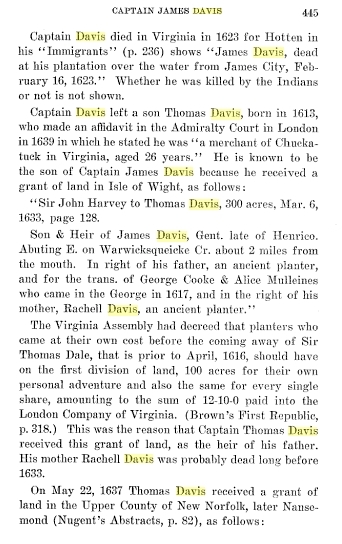 These early members of the Davis family in Maryland were from Virginia, and probably sons of James Davis, of Henrico, Gentleman, who came to Virginia in the good ship George in the year 1617. The records show that several of the Davises came from the Old Dominion into Maryland, and were perhaps kinsmen of Sir William Davis, of Bristol, England, to whom letters from Virginia are still extant. After the resurvey between Maryland and Virginia, lands in Somerset county were granted these two brothers by the Lord Baltimore, their estates being previously on the Accomac side. His Lordship’s rent rolls show that 7,000 acres in Somerset county alone were patented to members of the Davis family. On both sides of the Chesapeake members of this distinguished name were large landholders and lived in the lavish way peculiar to the Colonial gentry. The Davis men were from earliest times conspicuous in the military affairs of the Province. In the year 1667 we find Capt. Hopkins Davis commanding a company of foote (soldiers) in Choptank and Miles river, Talbot county, and Capt. John Davis, of the same county, martialling his men against attack. Among the men of this name who were paid by the Assembly of Maryland for public services to the Province prior to 1685 were George Davis, Griffith Davis, John Davis, Thomas Davis, William Davis, Samuel Davis and Jonas Davis. In the year 1694 John Davis was appointed commissioner and justice of the peace for trial and cause for Talbot county, of which he was also a military officer. While it has been claimed that the Western Shore Davises did not arrive in Maryland until much later than those on the Eastern Shore, the Colonial records disprove this, as above shown. As early as 1694 John Davis was a justice of Prince George’s county. The names of Samuel and John Davis appear in a list of loyal subjects in Somerset county in 1689, in which year a petition for a Protestant government was addressed to the King. While the Davis men filled with fidelity many civil offices of importance and served their government on the Colonial field, including the French and Indian wars, it is especially notable for the large number of commissioned officers in the Revolutionary service. Robert Paine Davis, ensign of Capt. Thomas Watkins’ company, on West river, in Anne Arundel county, 1779. There were other officers and no less than 50 privates by the name of Davis who served in the Maryland troops during the War of Independence. While from the foregoing we can have no doubt as to the patriotic blood of the Davis men, yet more than once the name is enrolled among those who held the scales of justice, and while so many of the family were giving their lives to their country’s service Samuel Davis, of Kent, and Richard Davis, of Washington county, were filling the honorable and important office of justice of the county courts in the year 1778. 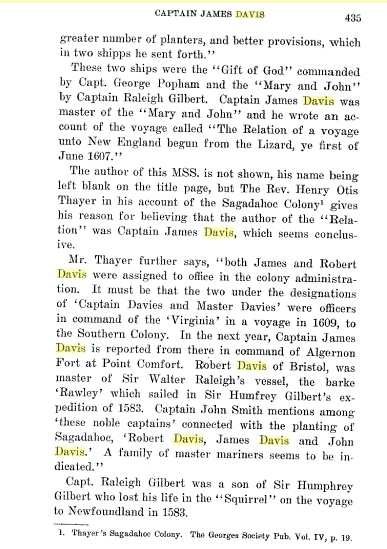 In the journal of the Council of safety reference is made to Captain Davis as “sea commander.” While one of the early rectors of William and Mary Parish was Thomas Davis, we find Rev. 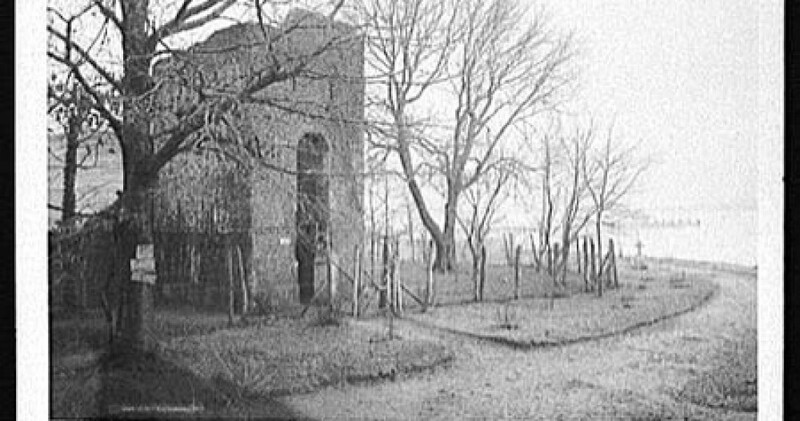 Samuel Davis preaching to the early Presbyterian flock in Somerset county, where his name is still revered as one who helped to plant the vine in the virgin soil of the New World. The various branches of the Davis family in Maryland intermarried with the other representative Colonial families, and particularly is this the case in the branch in Anne Arundel county. Here we find Richard Davis marrying Ruth Warfield, daughter of John Warfield and his wife, Ruth Gaither, whose ancestors first settled in Virginia and took part in the affairs of that colony. The children of this marriage of Richard Davis and Ruth Warfield were Richard, John, Thomas, Caleb, Elizabeth and Ruth Davis. Caleb Davis arrived at man’s estate, like others of his family, in time to fight in the Revolutionary War. He married Lucretia Griffith, daughter of Orlando Griffith and his wife, Katharine Howard, daughter of Capt. John Howard, Jr., and Katharine Greenbury. Ruth Davis, sister of Caleb Davis, married Joshua Warfield, the son of Benjamin. Elizabeth Davis married John Marriott. Other marriages of Davises with well-known families was that of Ephraim Davis to Elizabeth Howard ; Allen Bowie Davis and Rebecca Comfort Dorsey, daughter of Chief Justice Thomas Beadle Dorsey and his wife Milcah Goodwin. As in so many old Maryland families, the Davises of the present generation find their paternal and maternal ancestors allied by kinship.In the case of the Democratic nominee for the Vice-Presidency we find his Davis forebears intermarrying with the same blood that descends to him through his mother, Louisa Brown, the daughter of John Riggs Brown and Sarah Gassaway. This Sarah Gassaway was the daughter of Brice J. Gassaway and Katharine Warfield, Brice J. Gassaway was a son of Nicholas Gassaway and brother of Capt. John Henry Gassaway and Lieut. Nicholas Gassaway, all officers in the Maryland Line. Through his Gassaway ancestry Hon. Henry G. Davis and his children, as well as Gov. Edwin Warfield, on. Arthur Pue Gorman, Mr. William H. Gorman and others, trace back to the Dorseys, Howards, Ridgelys, Worthingtons and Greenburys. Contemporary with these and the eldest living representatives of the John Riggs Brown line are Mr. Vachel Brown and Mr. J. Frank Brown, of Baltimore. 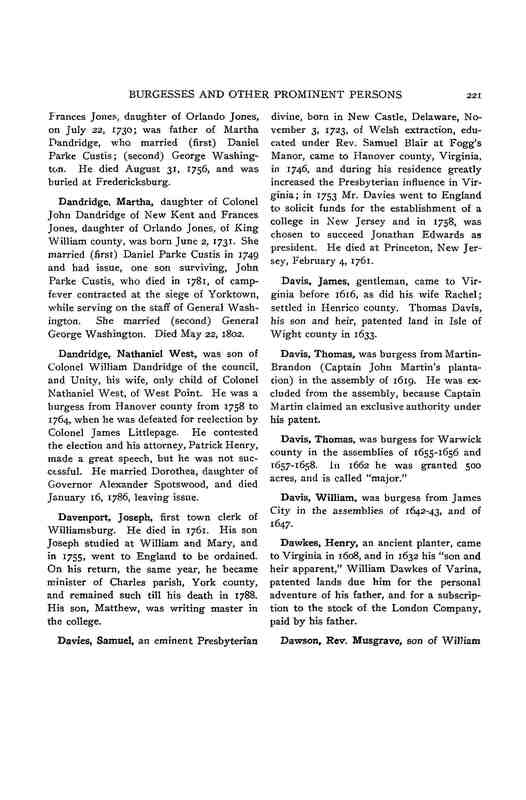 The various Colonial progenitors of the Davis family of Maryland include those who filled every important office in the gift of Lord Baltimore or of the people, hence it is only history repeating itself when we find in our own generation the representatives of the old governing families of the Province continuing to maintain the precedent set them by their worthy forebears. Every man or woman who is representative is as sure to have strong, notable ancestors as that like produces like. Goodfellowship, located in Howard county, but which originally lay in Anne Arundel county. This estate had been patented to Joshua Brown and Alexander Randall early in 1700 — about 1720. Later Caleb Davis, father of the Hon. Henry G. Davis, bought the part which had belonged to Randall and which adjoined the lands of his wife’s family, the Browns. On this ancestral estate our distinguished Marylander was born and lived until the panic of 1835 swept independence from his father, who sold his home and everything he possessed that others might not lose through him. With a heritage of cultured and distinguished ancestry on both sides and the high standards of life set him by a worthy father our new candidate for the Vice-Presidency faced the change of circumstances bravely and went to work as many a gentlemen’s son had done before him and because of the superior blood that was in him he soon attained the success which comes of earnest effort. From one post of honor to another he has been chosen to the second highest nomination in this country, and it is with pleasure that Maryland claims him as her own son and the representative of some of her most distinguished families. Capt. John Brice and others of equal distinction. Maryland and West Virginia ; Mrs. Stephen B.
Elkins, Miss Katharine Davis Elkins, Messrs.
Davis Brown, daughter of Lieutenant-Com. R. M. G. Brown, United States Navy ; Mrs. F.
Miss Mallonee, Mrs. George R. A. Hiss, Mr.
George William Kirby, of New York.